The last few weeks have been a bit of a festive whirlwind with present-buying and wrapping sitting alongside Christmas baking and work, of course. But at last (hooray, hurrah) I’m off work until 29th December, so finally I have a chance to breathe. 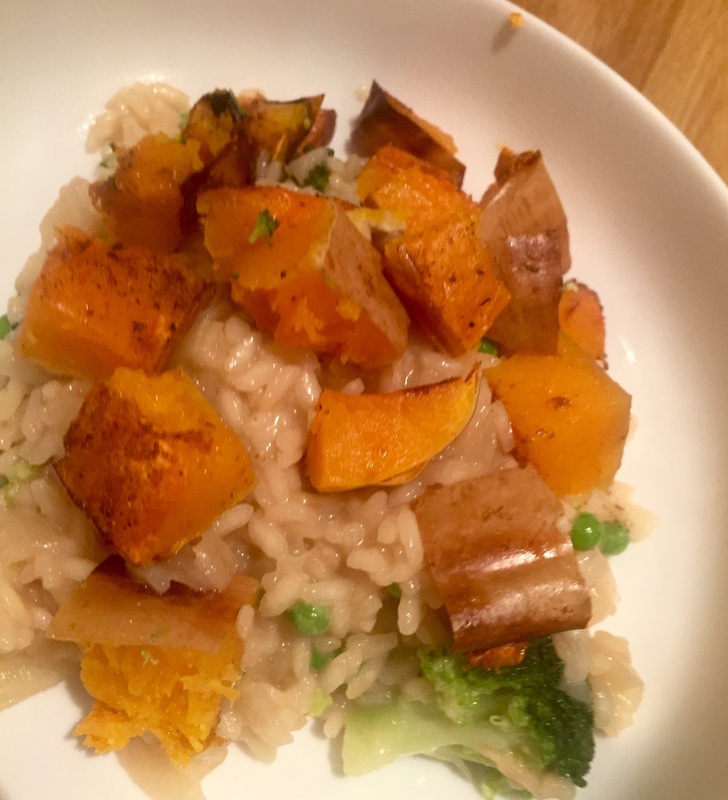 My first free evening was largely spent in the kitchen and on the floor wrapping presents, but I was feeling a bit more chilled than I have been and I’d bought a butternut squash at the weekend as an antidote to lots of meaty meals, so I thought I’d throw together a wholesome risotto for a bit of relaxation (yeah, I do actually find that sort of thing therapeutic!). This tasted so wholesome, comforting and filling without having to cook up any meat. You could so easily make this fully vegetarian, vegan and gluten-free by using vegetable stock instead of chicken stock, and if you use 80g of each vegetable, it can also make up 4 of your 5-a-day. 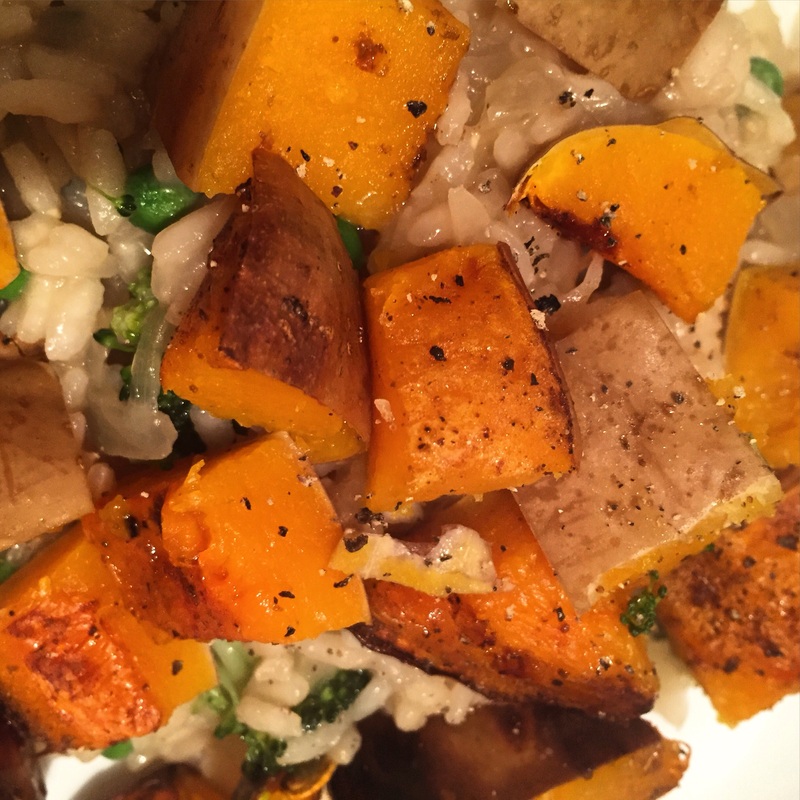 Add whichever veg you fancy – it’s also great with roasted sweet potato. As a bit of a warning, though, you’ll need about half an hour and a great deal of patience to make this dish. Once the liquid hits the rice, you’ll need to constantly stir it until it’s ready. Be prepared! I forgot about this part when I thought I’d be able to get a batch of mince pies ready for the oven at the same time! 1. Pre-heat your oven to 200c, line a baking tray with tin foil and get ready to roast. Carefully cut the squash in half from top to bottom and scoop out the seeds. If you need a hand with how to tackle one of these beasts for the first time, there’s a quick rundown in my squash soup recipe. 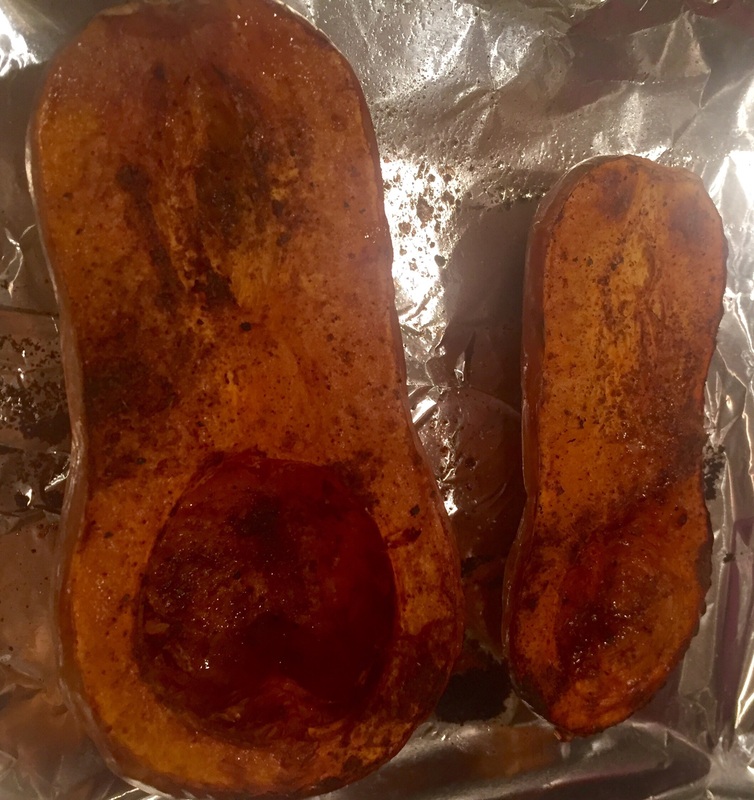 Once you’ve done that, place one half of the squash on the tray, sprinkle on the chilli and cumin, season and drizzle with oil, then shove it in the oven. 2. 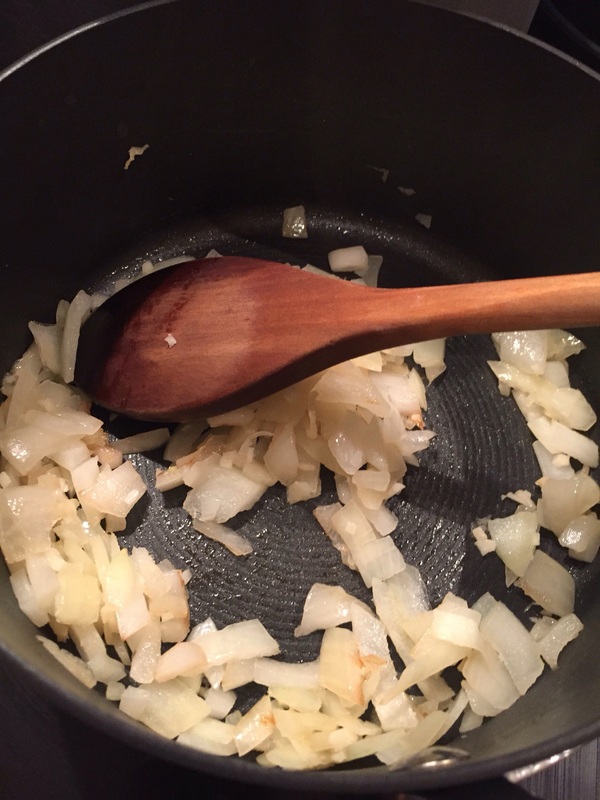 Finely chop the onion and garlic. 3. Drizzle a little oil into a medium saucepan and place on a medium to high heat. Chuck in the onion and garlic and allow to soften, stirring every now and then. 4. 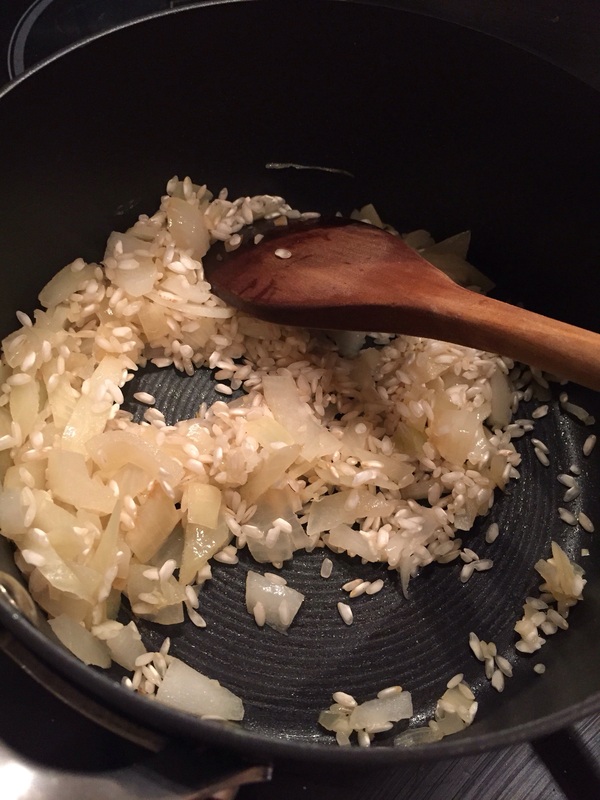 Tip the rice into the saucepan to join the rice and stir around for about 30 seconds or so, until you hear the rice start to crackle and pop, then pour in the wine. 5. Cook out the wine until the saucepan is nearly dry. Now comes the stock. This needs to be added a ladleful at a time, cooked out whilst stirring the rice, then repeated. 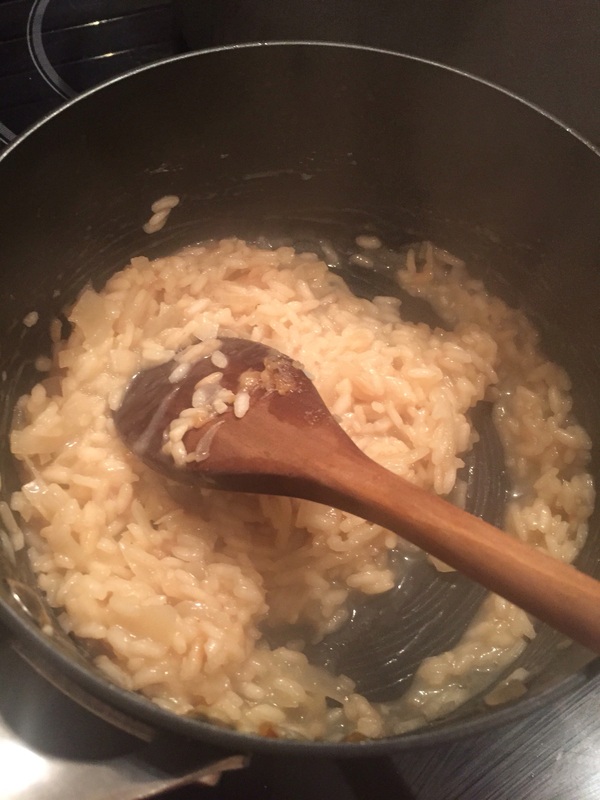 This process will take 20-30 minutes – risotto is traditionally served al dente, but I would recommend tasting it before serving up because home cooking is all about what you like. 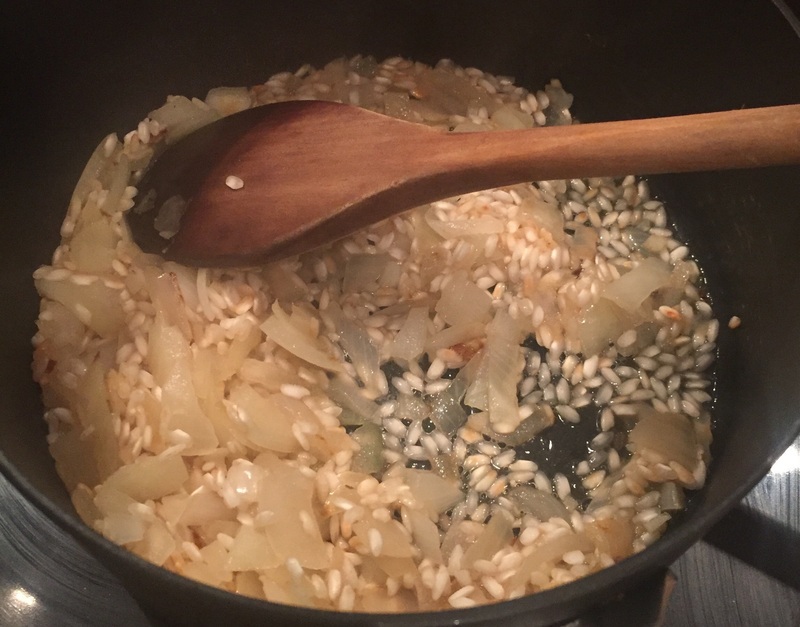 The stirring process is really important because it helps the starch to be released from each grain of rice, and it’s the starch which will give you a really creamy, unctuous risotto. 6. About 5 minutes from the end, cut up the broccoli into fine florets and boil it up in salted water. 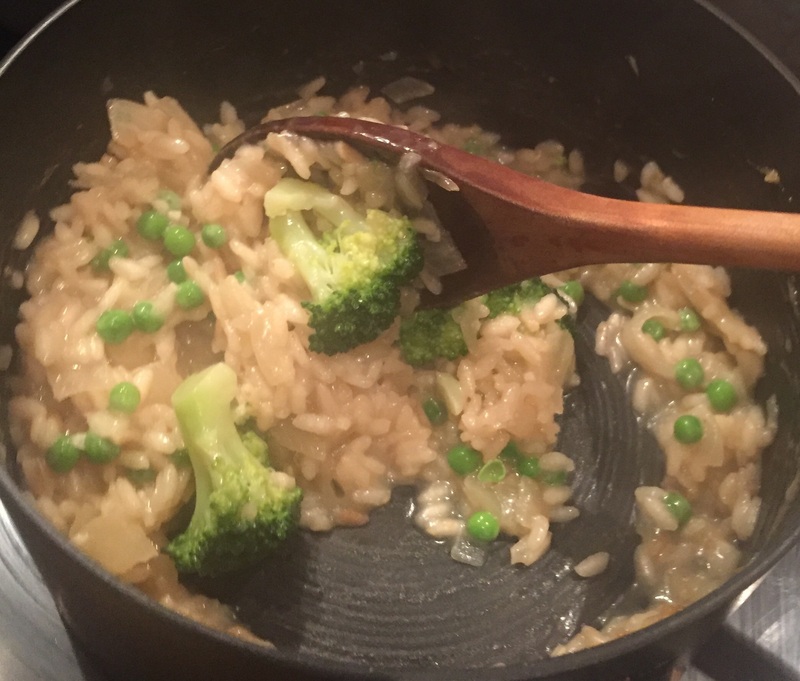 When the rice is ready, add the broccoli to the saucepan, then stir in the frozen peas. A couple of minutes in the risotto should be enough to defrost and cook them. 7. Check the squash. It should take 20-30 minutes to cook as well. It should be tender throughout and browning on the edges. 8. Chop up the squash into chunks. 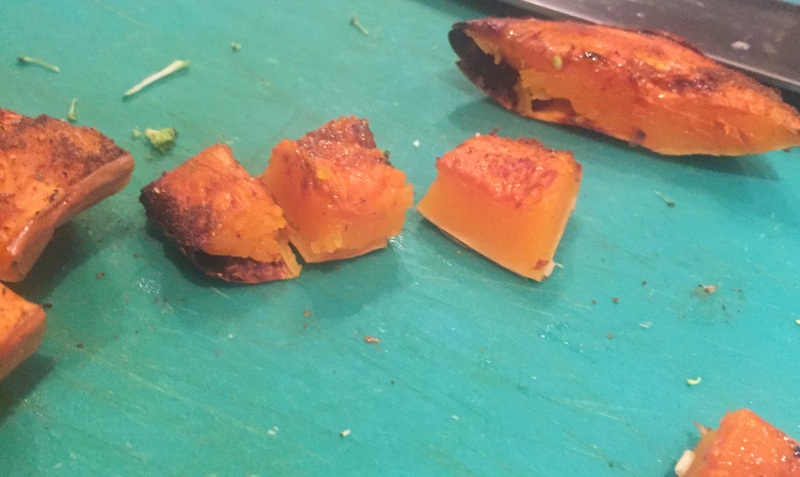 You can remove the skin before or after cooking, but, like many vegetables, a lot of the nutrients the squash offers are in the skin, plus it turns sort of sticky and marshmallowy when roasted. 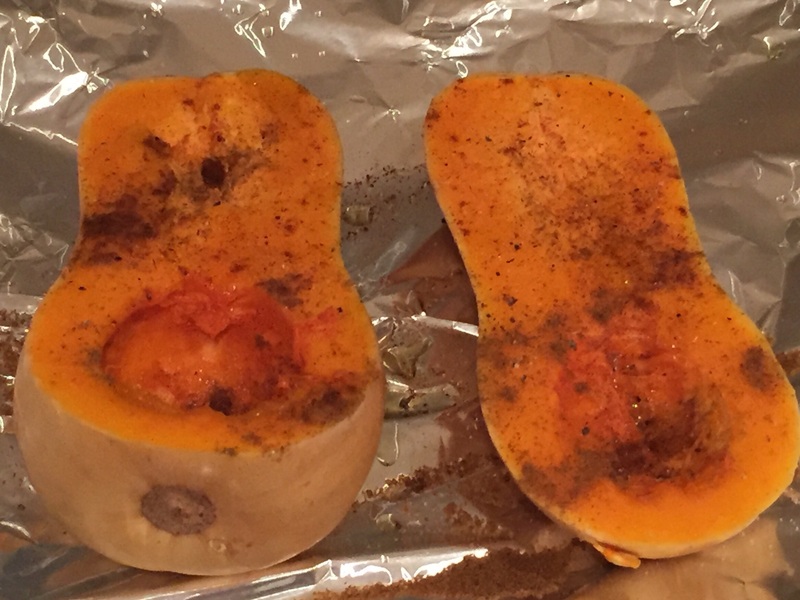 So yes, you definitely can eat the skin on a butternut squash! 9. Serve up the rice and add the squash chunks on top so they stay crispy on the edges. Then enjoy! If you want this to be extra creamy, you could stir in a tablespoon of crême fraiche before serving, or even grate some Parmesan over the top, however that would seriously bump up the calories, and of course remove the dish’s vegan and vegetarian credentials, but the world is your rice bowl. 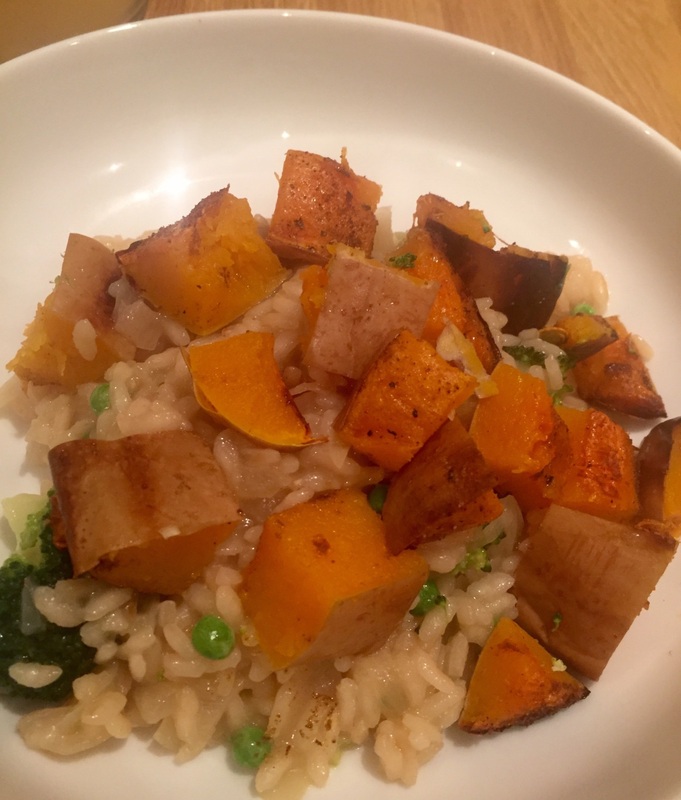 I’d love to hear about your favourite risotto and your favourite way to prepare and eat butternut squash.